Your Favorite Spot in Thailand? Suvarnabhumi (pronounced “Su-Wana-Poom”) means “The Golden Land”. One of the ways this can be achieved is to develop Suvarnabhumi Airport to achieve the highest international standards, to ensure its support for the rapidly increasing air traffic demand corresponding to the need of aviation business worldwide. His Majesty the King has graciously conferred the name of “Suvarnabhumi Airport” which means the “Golden Land” and is located in Bang Phli District, Samut Prakan province, covering an area of approximately 3,200 hectares. The Suvarnabhumi Airport, which is due to replace the overloaded and unexpandable Bangkok International Airport (Don Muang), is scheduled to open in June 2006. However, this date may be delayed until September 2006 for testing and validation by ICAO. The ‘New Bangkok International Airport’ company was formed in 1996 but due to political and economic chaos it took six years for construction to start. The new airport has also been delayed countless times due to cost overruns and construction problems. 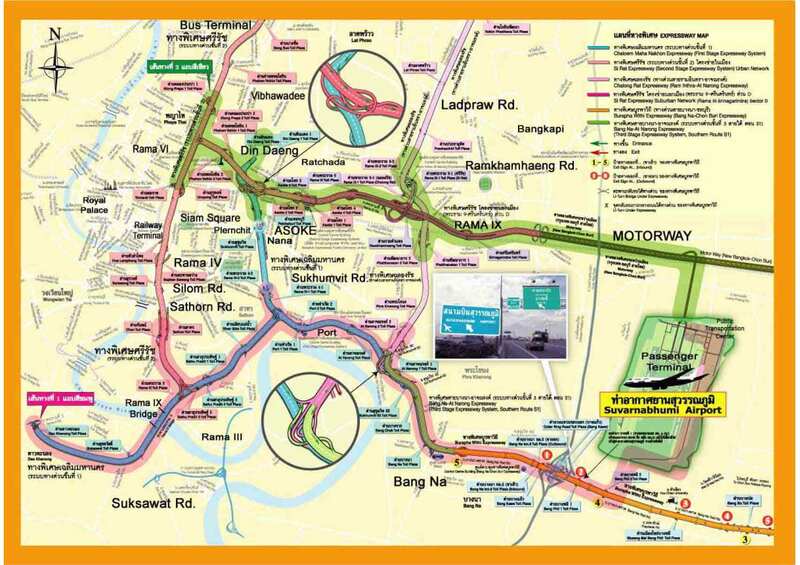 The new airport is located on a boggy, 3,100ha site in the Samut Prakarn province of Thailand at Nong Ngu Hao (translated as Cobra Swamp), 30km east of Bangkok. Construction of Suvarnabhumi Airport began in January 2002. Don Muang will be relegated to domestic-only status when the new airport opens. Don Muang is currently the world’s 22nd busiest airport and the busiest in Southeast Asia, but it has already reached its full capacity at over 37 million passengers per year. Suvarnabhumi will be able to cope with 30 million passengers per year when it first opens, a figure which will be increased to 45 million within a short space of time. Following further expansion phases, including two additional runways, it will cater for over 100 million passengers per year. The plot of land occupied by the airport with an approximate area of 8,000 acres (324 km²) was purchased back in 1973, but the Thammasat student uprising on October 6 of the same year succeeded in overthrowing the military government of dictator Thanom Kittikachorn and the project was shelved. After a series of ups and downs, the “New Bangkok International Airport” company (NBIA) was formed in 1996. Due to political and economic instabilities, notably the Asian financial crisis of 1997, the civil construction began only six years later in January 2002. The airport is located in a once low-lying marsh, formerly known as (“Cobra Swamp”), which took about 5 years (1997 – 2001) to clear through land reclamation. In 2005, the construction supervision and management was transferred to the Airports of Thailand PLC, while the NBIA company was dissolved. The airport was due to open in late 2005, but a series of budget overruns, construction flaws, political interference and allegations of corruption continues to plague the project, and after much speculation the Prime Minister Thaksin Shinawatra announced that the airport would be open by September 2006 at the latest. Symbolic first test flights involving two Thai Airways aircraft were held on September 29, 2005, a previously announced deadline for opening. The construction of the City Airport Terminal in Makkasan and a 28.6 km high-speed rail link to the new airport started in July 2005 and are planned for completion in November 2007, although this deadline, too, seems unlikely to be met. The airport express, informally known as the Pink Line and operated jointly with SRT’s planned Red Line commuter service, will connect with the BTS Sukhumvit Line and MRT Blue Line at Phaya Thai and Phetchaburi stations respectively, offering airport-bound passengers a fast 15-minute limited stop journey from the city. © 2005 - 2019. Airport Suvarnabhumi.Com. All rights reserved.